Today, my wife Terrie and I went out doorknocking for the 22nd Open House at Lancaster Baptist Church which will take place this Sunday. During our soulwinning time we were able to meet several families who committed to being our guests this Sunday. Throughout this week, members from our church will devote much time to personally inviting each household in our community to join us for this special service. Many people will go out each morning and evening in efforts to personally invite our entire Antelope Valley to come see what God is doing at our church! One of the highlights of the week will be our Saturday morning soulwinning. This year we have over 1,000 church members committed to be a part this Saturday. I believe one of the reasons that God has blessed our ministry is because we have been faithful to do what he has called us to do. Jesus said in Matthew 28, “Go ye therefore, and teach all nations, baptizing them in the name of the Father, and of the Son, and of the Holy Ghost:Teaching them to observe all things whatsoever I have commanded you: and, lo, I am with you always, even unto the end of the world. Amen.” As we have kept our focus on soulwinning and on reaching others with the Gospel of Jesus Christ, God has continued to bless His work here in Lancaster. 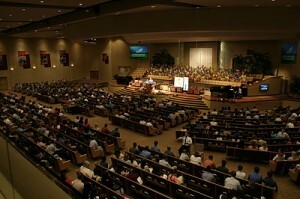 Please pray that souls will be saved this week during the Open House services at Lancaster Baptist Church.